Our style is a clean look with plenty of white space. We keep your website up and running by hosting on a secure, eco-friendly web server provided by UK company Memset. We also setup and host and email. We can purchase and manage domains on your behalf. 'Oh yeah', we are also very fast and affordable. 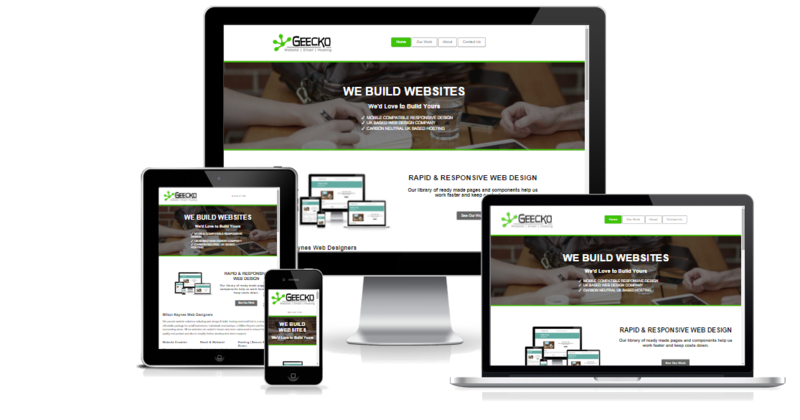 All our websites are responsively designed for use on mobile, tablet & desktop. The code is validated to pass the W3 standards for HTML5 and CSS3. We use open source software, PHP for any dynamic content and jQuery where necessary for client side animation, validation and/or interaction. Whether you are looking to increase awareness, generate leads or to showcase a product or service. We use purpose in your design to ensure it is relevant for keywords in the search engines. Search engines are getting smarter by improving the algorithms all the time so it is important that your website is coded correctly. We write code that helps to attact and encourage visitors to click through to your website and your call to action. We ensure your website will load quickly in the browser and work well in the latest web browsers and devices. We work with you to ensure your website fits with your current brand, style, tone of voice and colour. Your website will be constucted in a live environment at a temporary address allowing you to see the progress or collaborate on changes in real-time. Check out the our client websites, click around and read the feedback they have sent us. If you have any questions or would like to work with us then please contact us.